Under the Rules of Golf a player may use any conforming ball to start a hole and may change the brand and model of ball they are using between holes, or whenever the Rules permit them to substitute a ball during a hole (e.g. when taking penalty relief from a water hazard). Committees may introduce a Condition of Competition that requires players to use balls of the same brand and model throughout their stipulated round. Whilst this Condition is used in most pro tour events, it is rarely introduced in any amateur competition. It is my understanding that this Condition is not used in the PGA of America Championship and Ryder Cups played on US courses, though it is used in PGA Tour, European Tour and most of the other major golf tournaments. It did apply to last week’s Presidents Cup singles and four-balls, but not to the foursomes (alternate shot) played on Thursday, where the member of the side that was teeing off at each hole was permitted to play the ball of their choice. This can present a problem for team Captains when selecting their foursome pairings, as there is considerable difference between the types of balls that professional golfers play. Phil Mickelson recognises that he made a mistake in not checking whether the ‘One Ball’ Condition was in effect in the four-ball matches before playing the ball that he had changed to, so as to get more distance and less spin from his drive on the par-5 7th hole. During a stipulated round, the balls a player plays must be of the same brand and model as detailed by a single entry on the current List of Conforming Golf Balls. Match play - At the conclusion of the hole at which the breach is discovered, the state of the match is adjusted by deducting one hole for each hole at which a breach occurred; maximum deduction per round - Two holes. Note that the penalty is not applied until the end of the hole being played, so Phil could/should have continued play of the hole, with the type of ball that he had previously been playing with, to try and achieve a win over the opponents. 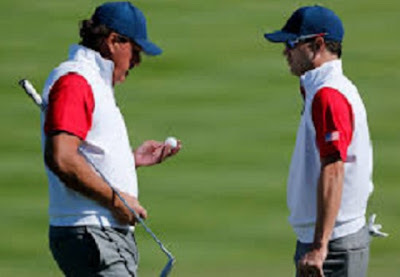 Unfortunately, when Phil realised that he may have breached the ‘One Ball’ Condition, and had this confirmed by US team Captain, Jay Haas, he was wrongly informed by an official that this meant that he was disqualified from the hole and so he did not play out the hole. When Zach Johnson failed to match the birdie of Jason Day the Americans effectively lost two holes over the play of one hole. It is important to understand that it was Phil that brought his breach into the open. It is almost certain that no-one would have noticed the difference in the two Callaway balls he uses, had he not sought confirmation as to whether the ‘One Ball’ Condition was in effect for the President Cup four-balls. Arguably, the penalty cost Phil Mickelson and Zach Johnson their halved match against Adam Scott and Jason Day, but the American team did go on to win this year’s Presidents Cup by 15 ½ to 14 ½. After celebrating much too enthusiastically on New Year’s Eve, George arrives at the first tee for his New Year’s Day match against his arch rival, Bill. Things don’t go well for him and unbelievably (!) he is 7 holes down without having struck a ball, when he concedes the match. George has not conceded any stroke or hole and has not breached a Local Rule or Condition of Competition. Explain how this could possibly have occurred under the Rules of Golf. When you have given this some thought you can check out the solution/explanation at this link. I now have nearly 7 years of weekly articles on my blog site, covering most areas of the Rules of Golf. You can often find the answers to your Rules questions by entering a short search term in the 'Search This Blog' box at the top right corner of my blog pages. I was surprised there was no criticism of the rules officials who apparently did not have a clue what was going on. How can they possibly be selected for such a role in a prestigious event when they are so incompetent? What is the situation when rules officials make such appalling mistakes? I know in stroke play you can play a second ball, but this not allowed in match play. In my opinion, in equity, whatever that really means, as soon as Phil knew he had been incorrectly disqualified from the hole he should have demanded to be allowed to go back to the hole in question, replace his ball with the correct one, as is allowed by the rules, and play out the hole. I am always amazed by the ignorance of professional golfers on the rules, considering mistakes can cost them vast amounts of money. Unfortunately most of the golf commentators on Sky Sports in the UK are ex-professional golfers. At the end of the session where this incident occurred, after repeating ad nauseam that they had never heard of such a thing, they displayed two rules on the screen, 15.1 about finishing the hole with the ball teed off with, unless the rules allow substitution and 15.3 If a player makes a stroke at a wrong ball, he loses the hole. – neither of which had any relevance to the situation. I am sympathetic to the point that you are making, but you seem to be forgetting that Rule 6-1 states that players (and the caddies they employ to look after their interests) are responsible for knowing the Rules. The vast majority of matches are played without the luxury of a referee on hand. When a referee is asked for a ruling it is because the player is not sure of the appropriate ruling and when they give a decision it is final, even if it is wrong, Rule 34-2. I certainly agree with your comments regarding the lack of knowledge of professional golfers and media commentators and have referred to this in my blogs several times over the past few years.